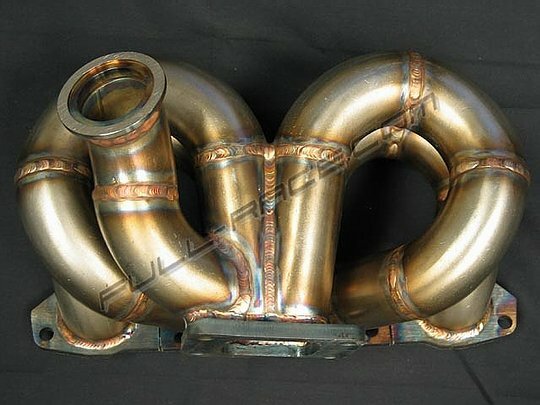 Full-Race designed turbo manifold for the Honda S2000. This manifold is a must for those seeking to extract maximum power from their turbo setup. - Must relocate battery. Hawker energy PC680 battery recommended. - Heat shielding highly recommended. - Fuel, tuning and engine management highly recommended. - The merge collector creates a turblent free area for the exhaust gasses to enter the turbine housing in even pulses at high velocities. - Robotic TIG welding for ultimate strength and longevity. - Flange surfaces machined flat ensuring a perfect seal. - ProStreet manifolds are CAD/CFD designed. - ProStreet manifolds allow powersteering to run in conjunction with the manifold.